Jack Ma is a prominent business figure and a self-made billionaire. 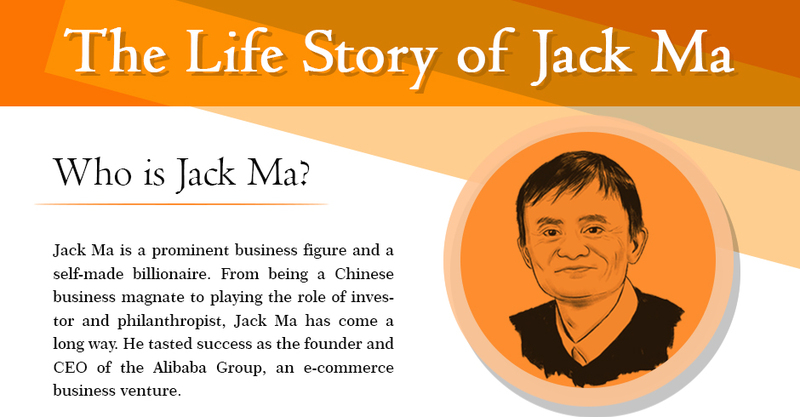 From being a Chinese business magnate to playing the role of investor and philanthropist, Jack Ma has come a long way. He tasted success as the founder and CEO of the Alibaba Group, an e-commerce business venture. Born: 10 September 1964 in Hangzhou, Zhejiang, China. Parents: Ma Laifa and Cui Wencai who were storytellers and musicians by profession. Teenage Life: At young age, Ma worked as a guide at Hangzhou international hotel for free. He offered city tours to foreigners to practice and improve his English. Academics: Failed three times in University entrance exam. Graduated from Hangzhou Teacher’s Institute with B.A. in English in 1988. Got rejected from 30 different jobs. Applied for job at KFC, out of 24 applicants, he was the only one to get rejected. Even applied to Harvard Business School and got rejected ten times. After graduation, became an English teacher at Hangzhou Dianzi University for $12 per month. 1995 – Ma visits US, and his friends introduce him to the Internet and computers. ‘Beer’ was the first word he searched on the browser. Searches information about China but notices no mention of his country on the Internet. Together with a friend launches an ugly website offering information on China. As soon as the website goes live, he starts getting a call from Chinese investors. 1995, April – Raises US$20,000 together with his wife and a friend to open his first company. The company was named ‘Chinese pages’ that helped companies with website creation. Within three years, his company made US$800,000. 1998 – Appointed as the head of an information technology company, founded by China International Electronic Commerce Center. 1999 – Quit his job and founded Alibaba, a China-based business-to-business marketplace site. The e-commerce startup began operating from his apartment together with 17 of his friends. For his venture, he raised funding from SoftBank and Goldman Sachs in 1999. 1999-2000 – Alibaba receives funding of $25 million foreign venture capital investment twice. 2003 – Jack Ma founded Taobao Marketplace, Ali Mama, Lynx, and Alipay. Rejects eBay’s offer to purchase company Taobao. 2005 – Gets $1 billion investment from Yahoo co-founder Jerry Yang. 2014 – Raises the biggest IPO of over $25 billion, breaking all the records in the US financial history. Established his company Alibaba as the world’s largest retailer. 2018 – Jack Ma retired as CEO of Alibaba Group to pursue educational work. He is the founder of Jack Ma Foundation, a philanthropic organization. 2017 – Made acting debut with Gong Shou Dao, a Chinese kung fu short film. 2005 – Selected as a ‘Young Global Leader’ by the World Economic Forum. 2014 – Listed by ‘Forbes’ magazine as one of the 30 most powerful people in the world. 2015 – Asia Awards felicitated him with the ‘Entrepreneur of the Year’ award. 2018 – Received degree of Doctor of Social Sciences from the University of Hong Kong.